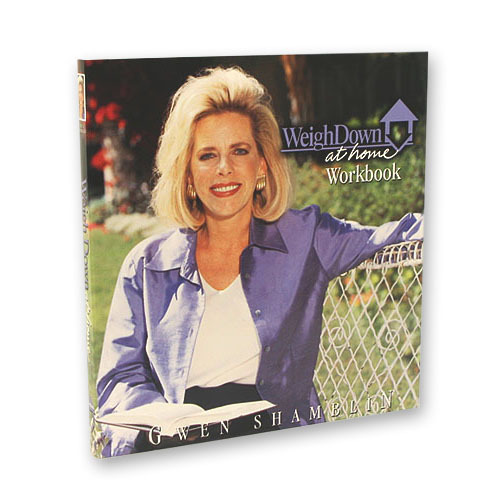 Extra workbook for the the Weigh Down at Home DVD Study. Purchase the entire self paced basic weight loss DVD Study. The set has 12 weeks of video lessons, 6 audio lessons, a workbook and the two very popular pocket guides "How to Eat Your Favorite Foods" and "Pocket Temptation Guide". In the Weigh Down at Home series, Gwen Shamblin, M.S.R.D. revolutionizes the weight loss industry by redefining the issues involved in weight loss and permanent weight control. She completely reverses the traditional focus on counting calories and fat grams and instead focuses the viewer on God, who created the body and the rules by which to feed it. I call this the "basic, basic workbook." The Basics workbook is awesome, but I felt overwhelmed with it at first. The WeighDown At Home workbook streamlines the program for me, making it easier for me to focus and apply WeighDown's core concepts and teachings. Thank you so very much for keeping this workbook in circulation and available for sale.